The longer we live in Hawaii, the more times I get asked — what’s your favorite hike? What do you pack? Where do I start? What are the best hikes in Hawaii? Can I come with you?! Admittedly, when we first got here, I felt the same way. I would always see cool pictures and then wonder…How the heck did they get up that mountain?! What is that place? For anyone who lives here, is moving here or coming for a visit — today’s post is for you. I’m sharing what you need to know about hiking in Hawaii, as well as what to pack for hiking in Hawaii and where you’ll want to go for hiking in Hawaii. I’m even sharing a great printable for the best Oahu hikes, so make sure you scroll all the way down! Now, let’s get started on hiking in Hawaii! First things first, you’re going to need something to power you through whatever adventure you decide to go on. Admittedly, I have a huge sweet tooth, but candy and pure sugar just isn’t going to cut it for strenuous hiking and activities. When I discovered DOVE® Chocolate Fruit & Nut, I felt like I had won the jackpot. A better-for-you indulgence option, it satisfies my craving for something sweet, but aligns with my fitness and activity goals. I like to keep homemade trail mix on hand at all times and with a few simple ingredients — you can, too! Head out to Walmart and grab DOVE® Dark Chocolate Blueberry & Vanilla Cashew. I like the Blueberry and Vanilla Cashew the best, but they also come in Dark Chocolate Strawberry & Cocoa Almond or Dark Chocolate Raspberry & Honey Roasted Almond. 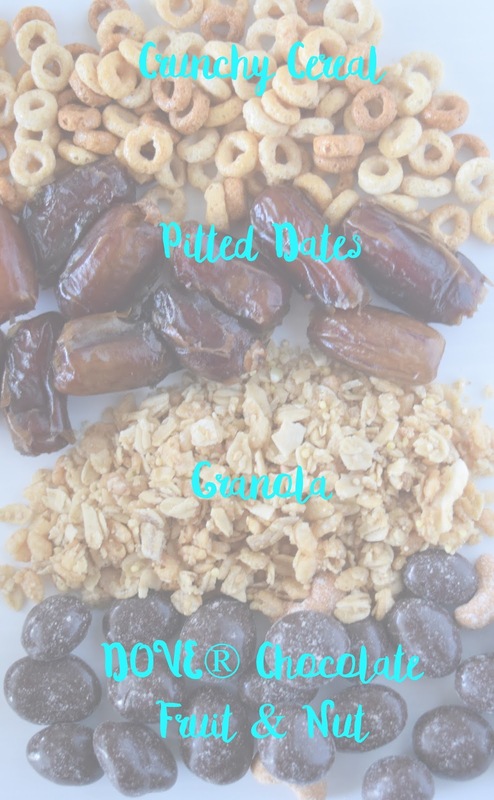 If you don’t already have it in your pantry, grab some granola, your favorite crunchy cereal and dates, too! Once home, mix one cup granola, one cup cereal, the entire pouch of DOVE® Dark Chocolate Blueberry & Vanilla Cashew and half a cup of pitted dates. I love this ingredient combination — sweet, salty and crunchy! When your mix is to your liking, seal it in an airtight container and store it in the refrigerator (especially if you live in a warm climate!). *It’s very important to note that some of these hikes are dangerous and everyone’s skill levels are different. Do your research before leaving home and never attempt a hike without proper gear. We just got new neighbors next door and when she mentioned she loved hiking, I knew the perfect little welcoming gift. I whipped up some trail mix and created a print off of all our favorite hikes for her and her husband to enjoy and reference. She told me last weekend they’ve already conquered a few! I’m so happy I was able to share my love of adventure (and snacking!) with someone new to Hawaii. Also, please note an error in the above graphic, Pele is the Fire Goddess.